Have you ever been working at a job and felt like the work you were putting in wasn’t worth the money you’re making? Or you booked a new client for your business at a rate lower than you liked only to regret it later? Or you’ve been in a meeting negotiating a salary for a new job and you accept their offer when in your gut you know you should have asked for more? Here’s the thing. As women, we are taught not to “ruffle any feathers” in our workplace. Many of us were raised with this mentality that as long as you work hard, people will notice and you’ll end up getting promoted and make the money you truly desire one day. All you have to do is work hard. Newsflash! Working hard is a part of an equation to your success, it’s not the key. If you wait for people to notice your work in order to move up the latter then you’ll be waiting forever. You have to learn to open your mouth and ask. Of course you have to start somewhere but you shouldn’t be at that same starting level for five years. Let’s face it, when it comes to talking about money, it’s hard and uncomfortable but it doesn’t have to be. You should be able to go into any room, confidently sell your skills and walk out with your desired pay, promotion or client. But no one is teaching us how to do this in school. In my almost 10 years of experience in the industry of business, I’ve learned how to negotiate my way into book deals, powerful relationships, business deals, corporate sponsorships and more. I learned how to produce key events with A-list celebrities and key tastemakers on an extremely limited budget by leveraging and negotiating into the hottest spots all over the country. No one taught me anything and I had to make a lot of mistakes before I gained the confidence to ask for what I want instead of constantly compromising. You might want to make more money at work or you want a new job making a new salary or you want to start charging a specific fee for the services you offer in your business but you may fear that you won’t get it. You can do it! All you have to do is leverage what you’re good at in order to make sure that you get what you want. So you know I got you! I’ve created perhaps the most important class yet on negotiation and getting what you want. I’ve learned that you simply have to change your approach to your relationship with negotiation and follow simple do’s and don’ts to help you build your confidence. You negotiate on a daily basis because negotiation is simply about all parties involved walking away happy. You might find yourself negotiating not only at work but when buying a home, renting an apartment, returning a pair of shoes, buying a new car or in conflict resolution with your loved one. So if you can negotiate with your man to take out the garbage or wash the dishes then you can get the check you want too LOL! Negotiation doesn’t always have to be about money either. Perhaps you may not get the salary you desire but you can ask for more vacation days. You might not get paid for that speaking engagement but you can ask to gather all the attendee emails so you can add them onto your email list. 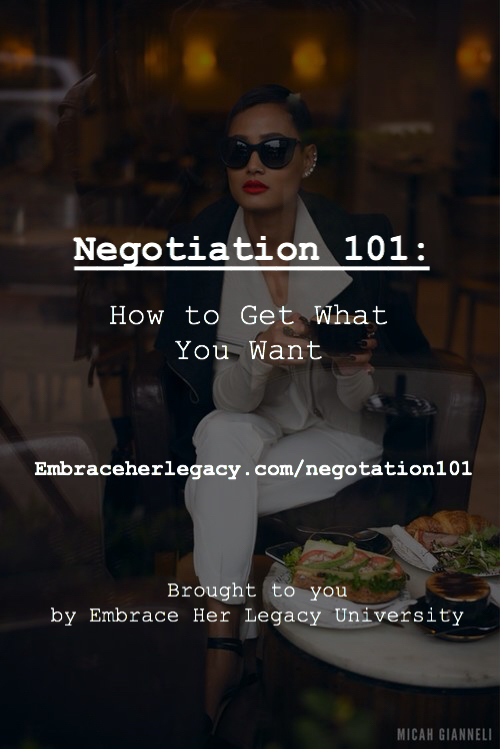 Download the latest audio lesson from our Embrace Her Legacy University, Negotiation 101 and start getting what you deserve!